Once a year I make soap. It doesn’t take a lot of ingredients, but it does take a lot of work, to make several years’ worth of homemade healthy, clean soap that doesn’t dry out your skin like commercial body soaps can. Many of the ingredients I have to order (i order mine from Essential Depot), but our home raised grassfinished beef tallow and my neighbour’s beeswax are key ingredients as well. We don’t manage bees on our farms, but our neighbour does and he shares beeswax with me. Lots of ways to farm. Thanks to our neighbour, Kevin, for caring for bees and their hives and producing great honey. He stopped by last week and gave me some wax. Agricultural production opportunities abound, but none that i’ve found come without dedication, hard work, and passion. It’s unlikely you’ll become financially wealthy either, but there is more to life than that. Beeswax mixed in with honey! Melt very slowly, best to use a double boiler, but in a pot is okay. Low heat! This mixture will boil very quickly and can catch fire! You do NOT want that nor do you want hardened wax all over your stovetop. Pour hot mixture through cheesecloth. Beeswax floats to the top and hardens after many hours. There was about a 24 oz container full of honey and wax, but resulting in about 2 oz of wax. The rest is strong honey I could use for cooking. I freeze the beeswax until I’m ready to make soap. Those 2 ounces can be added to make up to 15 lbs of soap. There are many articles out there addressing this and to be sure, each producer may do things just a bit different, so please don’t take this article as the end all for ‘how to purchase beef from a farmer.’ This is what we do. If it is important to you, ask questions or visit the producer’s website (if they have one – many don’t, we are producers not techies or salesmen) about how the animals are handled and raised. Are the beeves you sell fully grass finished or grain finished (feedlot) do they receive grain on pasture? If so, is the grain non-GMO? Is your farm and animals raised organically? certified organic (3rd party certification)?, (Certified organic animals/meat must be processed in a certified organic abattoir, all this adds tremendously to the cost of certified organic but doesn’t necessarily mean it’s better than your local producer.) For example, many of us raise fully grass-fed and finished from conception to consumption, no implants, no synthetic dewormers, no antibiotics, etc, etc. But, we might treat some brush in the next paddock with weed killer, so no way can that animal be certified organic. Also, even if our farm and animals could be certified organic, if there isn’t a certified organic butcher shop, the meat cannot be certified organic. I would have to make a 4 hour one way drive to a certified organic butcher. Not going to happen. Why can’t i just ring up and you have a beef available? Don’t you keep cattle year round? Yes, we keep cattle year round, but most of us are cow/calf producers and will only finish enough animals to fill orders placed six months or more in advance. Once an animal is finished, it needs to go to slaughter – every day that it is still on pasture, it is losing money. Most of our animals are sold as calves through traditional markets, so if you haven’t ordered a beef well in advance, we won’t have saved back enough beeves to finish one for you. Also, sometimes the weather plays havoc with finishing times as well. If you want factory finished feedlot beef, you’ll have to go the store. You may want to visit the farm before making a purchase, but remember, we are producers, not salesmen – if you aren’t serious about making a purchase, please don’t take up too much time. Be prepared ahead of time with questions. You may decide after you meet with the farmer and see how he operates, not to purchase, but don’t take up time just out of curiosity. If you decide to purchase, already have it in your mind how much you want to buy. For example, a typically grass-finished carcass will weigh 600-700 lbs. Be sure to ask the producer, his might be bigger or smaller, but armed with that information, you can quickly determine whether you need a whole, half, or quarter carcass AND you can budget for it. Be prepared that the carcass may be larger than the producer says – we cannot guarantee an exact hanging weight. We are just not that good. We can usually get within 50 lbs more or less. Quarter carcasses are more likely sold as a split side rather than a hind or fore quarter, but ask; some producers sell both ways. Half and quarter (split side) will be more expensive – Why? because we have to find another buyer(s). So, figure out how much meat your family will eat in a year or 6 months. Most of us only offer beeves once or twice a year since it is time consuming to sell directly to the consumer, however, we are happy to do so if you are serious about quality meat for your family – we share that vision with you. For a rough figuring, say your family eats 2 lbs of beef per day. A whole beef of 600 lbs carcass will yield about 360 lbs of packaged meat. If you want enough for a year – buy two beeves. You must let the producer know at least 3-4 months in advance so he can keep the animal for you on pasture plus have it booked in at the butcher. Many local butchers shut down for deer season, which means all domestic animals have to be butchered, hung, and out by 1 October. They won’t take more in until the first of December, so it is critical to let the producer know well in advance if you want any. Spring time purchases can be just as critical because so many people want to get animals in. Once you’ve settled on a price (this will vary a LOT), then you may be expected to make a down payment to hold your beef. This is reasonable. Kind of like making a down payment on a vacation trip or anything else you’ve spoken for to do in the future. Most of the time, you will pay the producer for the beef and the butcher for the processing. Our processor charges 44 cents per pound hanging weight for basic processing and $30 as a kill fee. But, i will tell you, that he charges less than most places and certainly less than a USDA inspected plant. If you want extras like burger patties, extra tenderizing, excessive deboning, or other specialties, these will be an additional cost. Work that out with the butcher. Your producer will give you the contact information. Retail Beef Cuts – most butchers are glad to help you with your custom order, but do a bit of study ahead to make best choices. Also, remember, local butchers aren’t going to be into fancy, exotic cuts, so ask about special cuts, but you may not get exactly what you want. You’ll also be asked how thick you want steaks cut and how many to a package, what size roasts and what kind. Deboned or bone-in. (i personally like a lot of bone – makes a ton of soup stock or treats for your dog, however, i always get my rump roasts deboned because i make corned beef with them). How many lbs of burger in a package (1 or 2)? Organ meats?, Suet? These are just a sampling. The butcher will tell you when the animal will be taken in to the butcher and it will likely be killed that day. If you want organ meats, you MUST notify the butcher in advance! Don’t forget this. It is not the producers responsibility to tell the butcher how you want your animal custom processed. If you don’t notify him, it will probably be thrown away, after which it cannot be salvaged. If you wait until after the calf is delivered to call the butcher, do so as soon as possible. Don’t make the butcher track you down and keep them waiting on how to process your calf. This is not polite. The producer will likely notify you within a day of the weight of the animal and what you own him. The animal is yours now and has your name on it, pay him promptly! Once the butcher calls you that the beef (or lamb) is ready for pickup, GO GET IT! Some butchers may start charging storage if you leave it for long. Just go get it and pay him for goodness sake. How Much Freezer Space? Allow 20 lb per cubic foot. That’s packing it in there, though, and won’t be handy for sorting and finding what you need. It will keep better in a chest type freezer kept near 0ºF versus your frig freezer or even a stand up freezer. A stand up freezer certainly takes less floor space, but the chest type is typically more energy efficient as well. What breed? Some breeds are naturally more lean than others, but if it’s in the feedlot on a high grain diet, it’s gonna be fat regardless if it’s Corriente or Angus. On grass, the genetics of the animal will be more expressed, but by and large, the producer will take the animal to a determined end point. Grass finished will generally have less cover and internal fat that grain finished. Hope this helps! Do some online googling and research – there are loads of info out there. Don’t assume the producer is producing in such manner that is important to you. Don’t complain about the price or the lack of availability. If you think a producer is too expensive, just shop elsewhere – don’t complain about it. Since both sons are still croupy and sick, and it’s still bitterly cold outside, another batch of soup is on the menus today. Last night, a 1 lb package of boiling beef was set out to thaw in the kitchen sink, then this morning, I dropped the meat into a 3 quart pot (I like my old copper bottom Revere Ware, but beware of the thin new stuff, it won’t sit flat on the burner for long) and added about 2 quarts of water and set to boil. As soon as the water comes to a boil, turn down the heat to simmer for 2-3 hours. Meat will become very tender. Take out the meat and let cool. While it is cooling, I add about 1 1/2 cups of chopped celery, 1 cup sliced carrots, and 1 chopped medium size onion. I know that’s a lot of onion, but onions are supposed to have curative properties, so I push the limit. Also, I add up to 2 tablespoons of garlic powder, 4 tablespoons dried parsley, 2 teaspoons dried sage, and 1 teaspoon powdered thyme along with a teaspoon of black pepper and 1-2 tablespoons Real salt. Pull the beef off the bones and any sinew and pull apart into bite sized pieces and add back to the pot. Let simmer for a while, once the veggies are cooked through, it’s ready, but even longer will allow the flavours and spices to meld, so enjoy leftovers! I have some day old bread that needs using up, so thin slices will be placed in the bottom of the bowl and the soup poured over top. Use organic ingredients if at all possible! Adjust and substitute to your family’s tastes. Arriving by divine providence and safety from the train depot in Inverness to our Open Views guest house is definitely a miracle. It all seems a blur to me now and I still have to get back to the depot somehow on the 5th! Nevertheless, we were not meeting our host until 4:30, so we went back to the Culloden Moor Battlefield site. We had visited this three years ago, but when we were on a tour bus and it arrived too late for us to enjoy the new visitor centre which gave a lot more information regarding the slaughter of so many Highlanders during this botched campaign. We met our Open Views host and were settled in shortly, then drove her back to Tesco, where we did a bit of shopping and she caught the bus home. Back to the house, fixed supper, and settled in for the evening. Wednesday, we took a long drive about. Visiting Forres, home of the Falconer Museum, a tribute to Hugh Falconer. No relation to me, but I had to have a photo in front of museum carrying my maiden name! 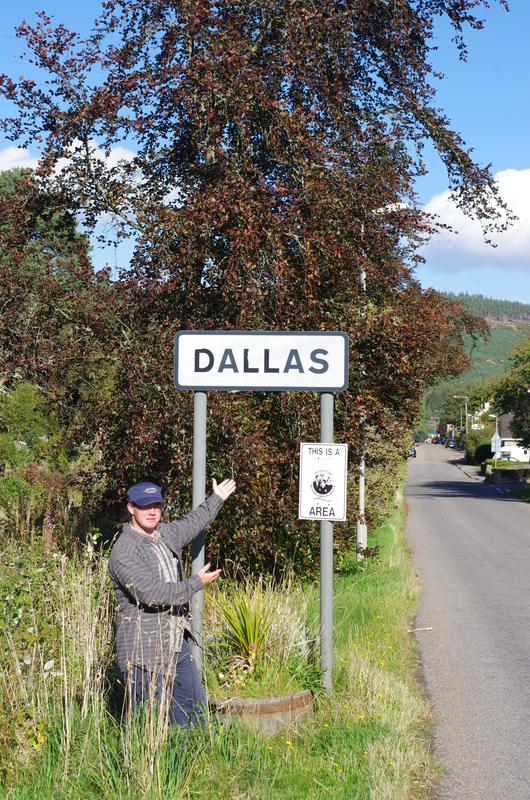 Then around and through the country to drive through Dallas, Moray, Scotland. Beautiful country of course, through and around back to Inverness and our home. Thursday, we had a blast with tree hiking at the RothemurchusTreezone and quad bike trekking on Rothiemurchus Estates in Aviemore. No photos of the tree hiking because the boys made me carry the camera and, of course, i was way behind, they left me in the dust! Yes, they managed the entire course nicely, BUT, I, too made it through both courses and never slipped off any obstacles. Okay, now two days later, I’m still sore! But, it was fun – I’d do that again. The quad trekking was well done with an engaging and friendly guide, but it was not what I expected. I had hoped for a tour of the farm, etc, but instead we just sped along the streams and track as one would do if they were just riding four-wheelers for fun. We had beautiful weather for this outing. Afterwards, we took the time to drive as far as we could to the top of the Cairngorm Mountain range. We purchased enough food at the Rothiemurchus Farm Store to cover our meals for the remainder of our stay. The beef was from grass-finished Scottish Highland cattle raised on the estates as well as the venison. Other items were produced by local families. All very good. More expensive for sure than Tesco or the Co-op, but I like to support local community efforts when I can. I’m going to admit it – I like haggis! Friday and Saturday, we pretty much rested in our guest home. I was pretty sore through my chest, arms, and shoulders even into Saturday! We took a few short exploratory walks around the area, but pretty much lazed about. We did go to the petrol station and fuel up so i wouldn’t have to worry with it on our departure Sunday morning. Also, tried with no success in finding accommodation for the remainder of our trip. Even this time of year, some areas of Scotland are packed! We set off early enough Sunday morning to catch our 9:59 am train to Aberdeen. The boys are usually frustrated with me because I tend to arrive early and then we wait – in this case, nearly an hour, however, stuff happens to cause delays, so I’d rather have a cushion of time before scheduled departures. There was very little traffic this Sunday morning, so we drove straight on in with no mishap this time. We took photos of the car, locked it, and threw the keys in the boot and off we went. No problem collecting our rail boarding passes at the kiosk and the train was spot on time for Aberdeen.